OTTAWA — Mark Stone continued his hot streak with two goals and an assist in the Ottawa Senators’ 5-1 win against the Tampa Bay Lightning at Canadian Tire Centre on Monday. Stone, playing on a line with left wing Zack Smith and center Jean-Gabriel Pageau, has five goals and three assists in the past four games for the Senators (25-23-6), who have won two straight for the third time since Dec. 1. Stone, who scored one goal in 14 games before his hot streak started, said he’s relieved the points are piling up. Pageau had a goal and two assists Monday, and Smith opened the scoring in the first period. The line has nine goals and 11 assists in the past four games. Ottawa forward Shane Prince scored his third goal of the season, and Craig Anderson made 31 saves. Pageau scored into an empty net after Tampa Bay coach Jon Cooper pulled goaltender Andrei Vasilevskiy with 8:36 left in the third period and the Lightning down 4-1. J.T. Brown scored his sixth goal of the season and third in five games for the Lightning (29-19-4), who lost for the second time in 12 games. Vasilevskiy made 24 saves. Ottawa coach Dave Cameron said Stone has been letting the game come to him lately. 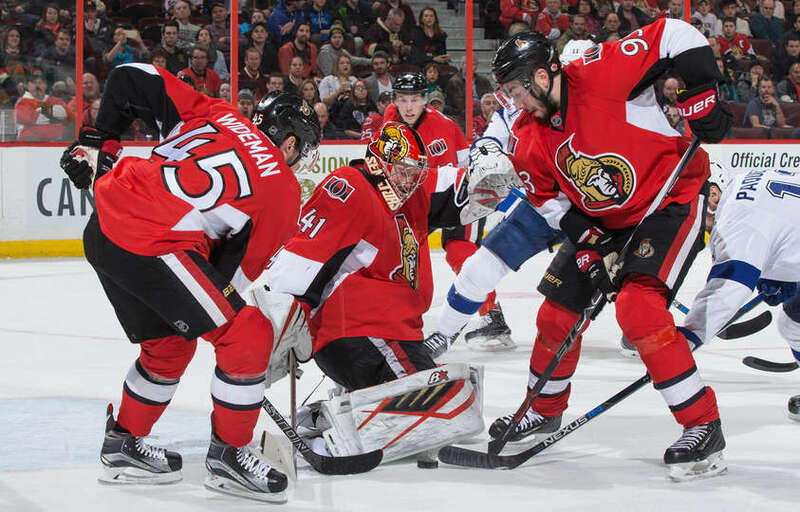 The Senators were in control from the opening faceoff against the Lightning, who were 15-5-1 since Dec. 12. “Eighty-two games. I think we all watched it,” Tampa Bay coach Jon Cooper said. “We’ve been on a pretty good run here, the last, I don’t know, month and a half, two months, and it came to a crashing halt tonight. That’s it. Ottawa’s penalty-killing, 30th in the NHL (74.6 percent), is showing signs of improvement. After going 4-for-4 against the Toronto Maple Leafs on Saturday, the Senators killed all three Lightning power-play opportunities. Stone helped give Ottawa a 4-1 lead with two goals in the second period. Some nice passing on the power play resulted in Zibanejad getting a wrist shot on net. Pageau, jostling for position in front, kicked the rebound to Stone, who knocked the puck past Vasilevskiy at 4:41. Stone scored his 16th goal at 10:46 with the teams playing 4-on-4. He curled at the blue line to give himself a little space, and then scored on the blocker side with Pageau cutting in front of the net. Ottawa led 2-1 after the first period on goals by Smith and Prince. The Senators, who are four points out of the second wild card into the Stanley Cup Playoffs from the Eastern Conference, have won three games in row once this season, part of a four-game winning streak Nov. 19-25. They’ll have a chance to do it a second time when they visit the Detroit Red Wings on Wednesday. The Lightning play at the Montreal Canadiens on Tuesday. Tampa Bay captain Steven Stamkos agreed. “We didn’t compete hard enough. We didn’t work hard enough,” said Stamkos, who was held without a shot for the fifth time this season. “We’ve been playing very well as of late. It started with a game a couple of weeks ago where we decided we needed to compete harder and work harder, then let the skill and speed take over. Defenseman Jason Garrison left the game after the first period with a lower-body injury. He will not play against the Canadiens, Cooper said. Defenseman Matthew Carle was a scratch Monday. Cooper said Tampa Bay might call up a defenseman from Syracuse of the American Hockey League for the game in Montreal.